2016 is crucial for the CGIAR Research Program on Forests, Trees and Agroforestry. After many achievements during the first four years of the program, we now are reaching a turning point. Our thousands of publications have been downloaded more than 1.5 million times, and hundreds of researchers have been guided and trained. We now need to capitalize on everything we built – our team, a collaborative spirit, management tools and strong partnerships – and embark on our second phase from 2017 to 2022. We will continue our emphasis on gender integration in all stages of our research, supporting open-access to publications and updating our data platforms and interactive portals. And, we are looking for new partners. FTA research will again be well represented at key events, as it was at the recent Asia Pacific Forestry Week. In June, an FTA-driven event, the Global Landscapes Forum: The Investment Case, will engage partners, policy makers and the private sector in determining science-based solutions to the earth’s biggest challenges. Read here what else our five flagships have planned for this year. This year means big changes for the FTA. The impact assessment for the entire research program will be released, and following that the FTA will move into a new phase of research to be finalized in March. But before all that, we asked our coordinators what else this year holds in store for research on forests, trees and agroforestry. Here are their answers. You don’t have to share what is sitting on your bedside table, but do send us a list of your five favorite publications related to forests, trees and agroforestry research in 2015. Based on your submissions, we will compile a list of the best reads for the FTA website as well as hold a drawing. The scientist whose name is selected will then have the opportunity to present his/her research in a video. Find out more here. Young scientists with Bioversity International wanted to find out how rural communities manage natural resources under different conditions. They used participatory, gender-sensitive methods and worked creatively around the challenges they faced. In this video, they discuss their experiences. Will you research with me? Understanding the roles that trees play in landscapes is at the heart of the CGIAR Research Program on Forests, Trees and Agroforestry. And, even after five productive years, this work is far from over and we are looking for reinforcements. At Asia-Pacific Forestry Week 2016, FTA scientists called for more partners to join them so that knowledge can be shared more effectively and have a bigger impact. The FTA’s assessment year is a fitting time to look at impacts on the ground. Throughout the year, we will be focusing on success stories. Where has your research made a difference? Has your research influenced policy, changed someone’s practice or impacted livelihoods and lives? Alert us to potential stories at [email protected] and we will publicize them as part of the FTA’s knowledge-sharing efforts. Gender experts shared their experiences improving gender balance in the forestry sector at last year’s World Forestry Congress in Durban. What worked? What didn’t? Where did it work and where did it not? Find out more here. With its new 2016-2025 strategy, CIFOR is stepping up to the new climate and development agendas. All CIFOR research will support the new development paradigm, tackling climate change while reducing poverty, protecting local livelihoods, rights and tenure, and enhancing ecosystem services. With CIFOR as the lead in the FTA, this will impact research on forests, trees and agroforestry. 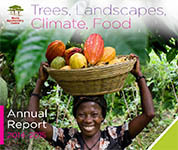 It couldn’t be clearer than Trees, Landscapes, Climate, Food – the title of the World Agroforestry Centre’s 2014-15 Annual Report. With ICRAF’s strong role in the FTA, this report says much about FTA research. Highlights include sustainable land management, the importance of public-private partnerships and the role of agroforestry for food security. Zero deforestation pledges are easy to declare, but implementation is complicated. Pablo Pacheco, coordinator of the FTA Flagship on Global Governance, Trade and Investment, takes an in-depth look at the palm oil sector in Indonesia and the obstacles to sustainable production. Agroforestry can contribute to all the Sustainable Development Goals, says Meine van Noordwijk, coordinator of the FTA Landscapes Flagship. At Asia-Pacific Forestry Week last February 2016, he made his case in front of practitioners and policy makers. Read here how they reacted. With more than 3,200 stakeholders from forestry, agriculture, water, energy, law and finance, the third Global Landscapes Forum in Paris broke its own record from 2014. The Forum’s organizers are gearing up for their next big FTA-driven event in London on 6 June, the Global Landscapes Forum: The Investment Case that aims to take investments in sustainable landscapes to the next level. How can forestry and agroforestry management practices be improved so that smallholders move towards integrated management and production of timber and non-timber forest products? This question is at the heart of an action research program in three Indonesian provinces that holds the potential to improve smallholder livelihoods. Low-emission development strategies (LEDS): How can REDD+ contribute?